Moving to Bentonville? Need to know all there is to know about the area? Contact Nicky Dou with Century 21! Lifelong resident of Northwest Arkansas and currently lives in Bentonville. www.NickyDou.com/5204Blairmont SOLD QUICK AS WELL! (both of these homes are located in Lochmoor Subdivision which has a community pool, playground, tennis & basketball courts and a putting green) - just around the corner from Central Park Elementary! 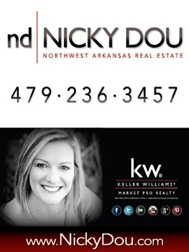 www.NickyDou.com/4602Branch - Great Home for sale in Brighton Heights off HWY 12 in Bentonville - close to new elementary opening up in 2012 & Central Park... GREAT HOME & PRICED TO SELL! Other listings will be coming up soon or we would be happy to run a search specific to your needs. EMAIL NICKY DOU NOW with your criteria and we will get back with you shortly!